Our featured teacher this week is no stranger to Kodable. Jen is an active contributor to our weekly #KidsCanCode Twitter chat, and was one of the awesome classroom hosts on our Kodable Road Trip tour last year. I got a chance to chat with Jen this week and learn about her unique teaching path that includes higher education, frisbee dogs, and working relentlessly to get kids coding! Congratulations on being Kodable Teacher of the Week! How did you get into teaching and when did coding become a part of the work you do? I began my teaching career in Chicago, and after a few years decided to pursue a Master’s degree in Science Education at Depaul University. 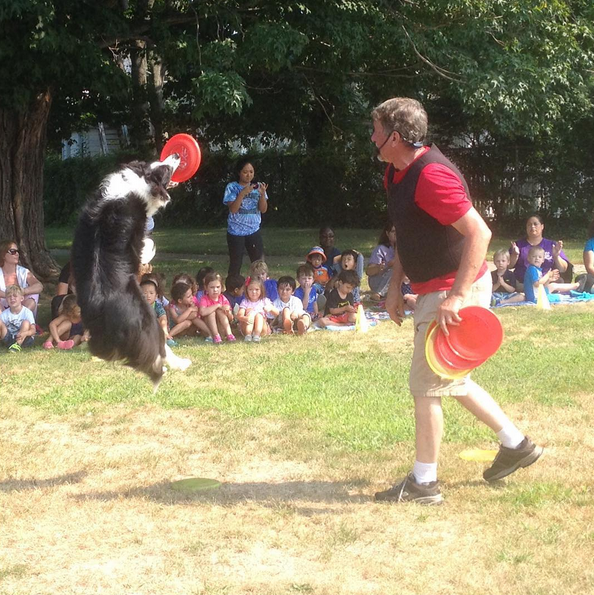 I took time off to focus on Frisbee dog work and travel, I was doing shows, and decided that I didn’t want to return to Chicago. I took a local K-3 technology assistant position and it’s now year three for me at Middlefork. Coding at Middlefork started with the hour of code, and I realized we could make it into a before-school coding club. I teamed up with our PE teacher and had the support of the entire staff and administration. From coding club, coding has grown to be the work I want to do with students. Elementary is new for me and I just love the age group. The kids are the best part of being a teacher, they’re why I do it. This age group is so awesome and fun, they make the experience for me. Technology Encourages curious nature and problem solving skills. It’s a vehicle to engage students. There’s so much excitement around robots, apps, Kodable. Using skills for this kind of work and engaging in challenges prepares kids for the next step in their education. Seeing it become a part of the school community and culture. It’s become part of the conversation around what we’re doing at our school. A culture around technology and code has grown from something we did in the morning to something we do. I get stopped by parents and siblings in the neighborhood and they’re excited about it. Younger siblings are coming into the school excited about getting to do what their brother or sister has done, and that’s exciting to see. Integration. We can continue to do amazing things and grow the club, but we’ll really feel like we are making it when we can embed activities into the work teachers are already doing. I do work with dogs. I try to make it a priority over the summer. It can be consuming to be doing webinars, teaching, and Professional Development. On the weekends when I do my work with dogs, I can recharge and set everything on a shelf for a day two. Self confidence. Seeing kids realize they can take on any challenge is so important. When I see kids asking questions on their own, away from school, I think we’ve done our job. I do a little bit of work in design and I’m trying to learn new maker projects. Any project that I can get absorbed in, it’s for me. Thank you, Jen! We are grateful that you shared your experience with us and that you’re equipping so many students with 21st Century technology skills! Join Jen and the thousands of teachers using Kodable to bring 21st Century skills to their students.